Telling a story using props/and/or costume (e.g. illustrations from the book, puppets, or hats) would be regarded as 2 skills—expressive speaking and use of propsTelling a story using voice, movement and song would be regarded as 3 skills—expressive speaking, movement, and singing. Telling a story using voice, movement, song and a musical instrument would be regarded as four skills- expressive speaking, movement, song and playing an instrument. The adjudicator is looking for the skills to be integrated into a fluent, structured performance. Students are given absolute free choice of content, the only regulation is to adhere to the word count. The completed story is submitted to the office and then to the adjudicator before the day of the Festival—on the actual day the student may read out their story or nominate someone else to do so- this is not part of the assessment, the adjudicator has already reached his or her decision and written the reports- the idea is to share the content with the audience and so then the adjudicator’s comments are more relevant to the listeners. We will be running a Creative Writing Workshop prior to this year’s festival so do join us if you wish to find out more! For many adults the thought of speaking in public is terrifying- it is generally recognised that the younger people are when they begin then the less likely it is that this fear follows them into their adult life. 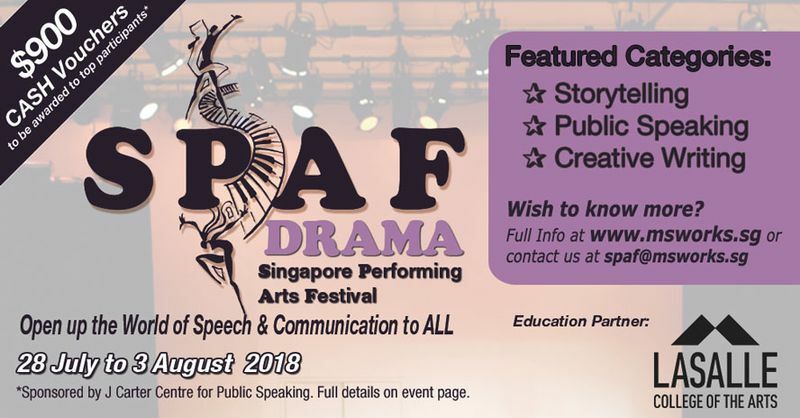 The Public Speaking Classes of SPAF are judged on both content and delivery and these are the aspects that we will be addressing in our workshop prior to the 2016 Festival in July. Full details of categories within syllabus info booklet. Email us at spaf@msworks.sg if you need further clarifications or assistance.